Nutrition can play an important role in experiencing symptoms of menopause. Because the body becomes deprived of certain vitamins and minerals during the onset of menopause, women have to supplement their daily diets with healthy foods, but also with products made specifically for relieving such symptoms. Health Plus Menopause Pack is advertised as being able to offer all the nutrients the female body needs as it goes through such important hormonal changes. Here is what a closer look offers about this specific menopause supplement, in terms of information on its efficiency. 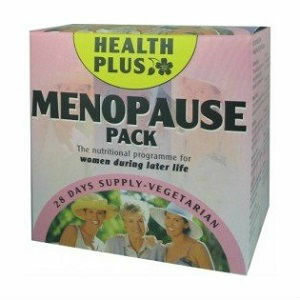 What Does Health Plus Menopause Pack Contain? We notice a lot of vitamins and minerals being included in this formula. For instance, calcium is very useful for maintaining bone health, since women are known to be more prone to osteoporosis than men, especially after menopause. Vitamin B is particularly useful for maintaining emotional well being, like other minerals make for important nutrients the body needs in these times of change. However, we did not see important herbal extracts, such as black cohosh and red clover, with known effects in treating symptoms of menopause. The recommended dosage is a sachet containing three tablets and one capsule. The listing price for Health Plus Menopause Pack is 20.22Euros, for a package containing 28 servings. We did not see a clear money back guarantee being offered on the manufacturer’s website, but contact details are offered, so you can get in touch with them regarding any issues. Health Plus Menopause Pack is a good combination of minerals, vitamins and fatty acids, to support the increased need for nutrients experienced by women as they go through menopause. However, we would have loved seeing more herbal remedies included like black cohosh and red clover, as these effectively target menopause side effects, like excessive sweating and hot flashes. Jackie Horowitz	reviewed Health Plus Menopause	on June 18th	 and gave it a rating of 2.5.